"From the Bay to the Blue Ridge"
With the cool weather approaching we thought it a good time to make a return to Mackie’s Bar & Grill on their 3rd anniversary. We are very familiar with this uptown eatery and enjoy lunch there quite often. We believe the key to their success is the fact that the food has remained consistently way above par since they opened and the service has maintained a high standard as well. Mackie’s is a 2 for 1 kind of place. Kind of like a “reverse mullet” haircut – business in the back and party up front. The bar in the front of the restaurant is always inviting and you can reserve the Ruby Lounge for a group of friends any day of the week. Two cushy couches and a middle table in the front window makes for a great place to meet. And…bottles of wine are 1/2 price all day, every day when you sit in this space! The “party” bar is usually packed with locals and regulars and can be a bit noisy, especially during sporting events on TV. The “business” section part of Mackie’s is located past the bar behind a half- inch thick opaque glass door. The door is usually open but when the noise level gets a bit high the door is closed and quiet returns. The décor of the dining room is masculine, which is what one would expect from a steak house. The deep red walls are nicely set off by the artwork, which on one wall depict Old Town and the other showcases local artists. Along one wall are white tablecloth four tops set between chairs and a full length padded bench against the wall. Against the other wall are a series of two tops. The room is very cozy. On this particular night we arrived a little early so the room only had about three tables occupied. This gave us a chance to talk with the owner, Sang Lee. In three years he has created a good following at Mackie’s and is always interested in his customer’s opinion. Introduce yourself…he is very approachable. We started off by splitting a Caesar Salad and Mackie’s Shrimp. 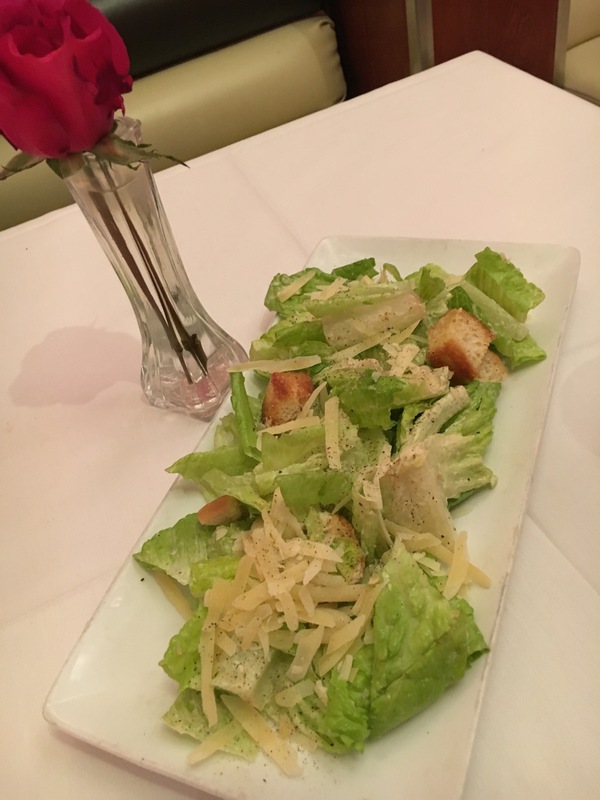 The salad was true to form…very fresh with shaved Parmigiano, house made dressing and croutons. In our case, it was a unanimous decision to skip the white anchovies that come with the salad. 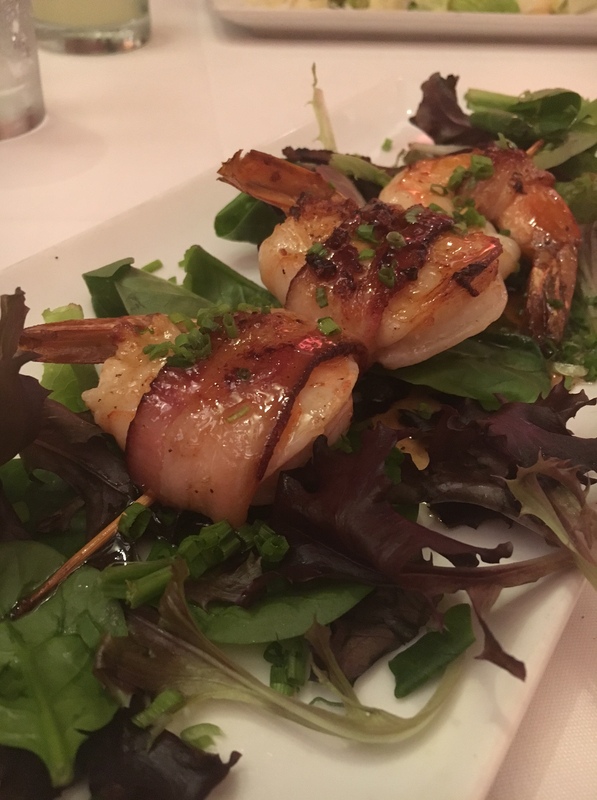 The Mackie’s Shrimp is three large shrimp wrapped in bacon on a bed of baby greens and drenched in a delicious maple glaze. This is always a favorite of ours and is available at the bar. If you like bacon, then Mackie’s is your place. Nueske bacon is the secret! My favorite at this restaurant is their BLT. Tons of Iceberg lettuce, thick sliced beefsteak tomatoes and smoked bacon, make for a hearty sandwich. Among their 13 choices for salads or appetizers is French Onion soup. This is a meal in itself. A rich beef broth that is packed with onions is then topped off with Gruyere, Provolone and Italian Parmigiano cheese. This item is also available at the bar and I indulge often. 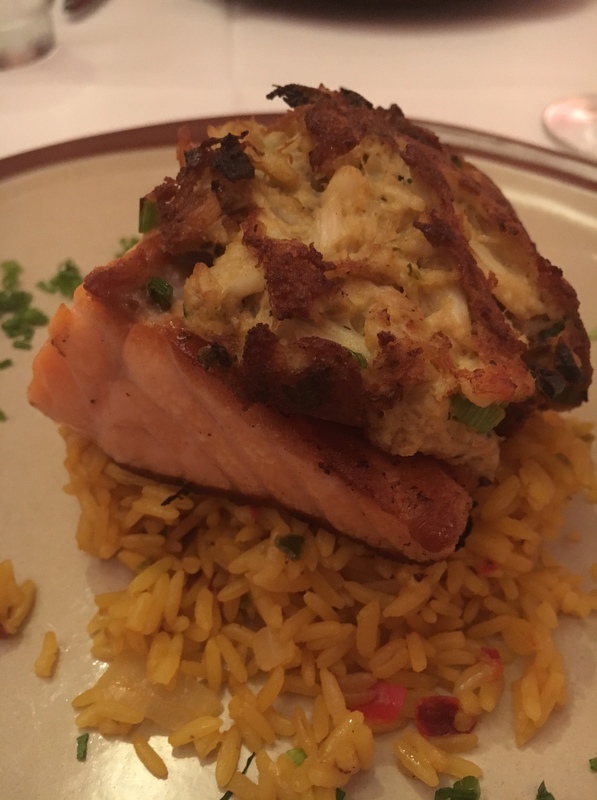 At the suggestion of co-owner, Susanne Mackie, I opted for the Salmon Oscar as my entrée – sushi grade Norwegian salmon, grilled and topped with a pan roasted crab cake, Cajun rice pilaf and pecan butter. The portions were generous with more crab cake than I expected. The crab cake was tasty with a reasonable amount of back fin crabmeat, although I thought just a bit too much time in the skillet causing the cake to burn slightly. The salmon was sumptuous and cooked just right almost to the point of getting my sushi fix as an added bonus. I could have used a bit more of the pecan butter but decided to keep my arteries intact. As is the norm for Mackie’s, I required a box to take the remainder home. While this dish is a good deviation from the beef, my favorite is still the pan roasted chicken breast – roasted “skin on” Frenched breast, mushrooms, roasted corn, sautéed spinach with a marsala sauce. If red meat isn’t your thing, try this. Also, on the menu are two great pasta selections – pappardelle alfredo or carbonara and shrimp scampi with linguini – that are both equally tasty. Over the last three years, we have had more than one of the steaks in the Mackie’s lineup on a regular basis. My G’nome dining partner is a steak snob and has stood by every steak she has had over the course. Mackie’s gets their beef from the Buffalo River Ranch in Amherst, VA so it is basically locally sourced. Her favorite is the filet mignon with the rib eye close behind. In her case, it’s the portions. The filet at 9 ounces is just right, while the rib eye at 16 ounces is too much. However, left over steak travels well. We dove into a rib eye on our last visit. Ordered as is off the menu it comes with roasted shallot Chianti sauce, baked gorgonzola gnocchi and the vegetable of the day. Mackie’s welcomes substitutions so if gnocchi isn’t worthy of your Weight Watchers points, there are options. We would be remiss if we didn’t bring up the award winning Mackie’s Dry Aged Burger. Voted as the #1 burger in the Alexandria Burger Battle, it is a burger lovers’ delight. Go in and check it out. The wine list here is very comprehensive and offers something for everyone’s taste and price point – remember the ½ price bottles in the Ruby Lounge? They have several beers available including the array of prerequisite craft brews. I am personally happy that they serve Bud Light! 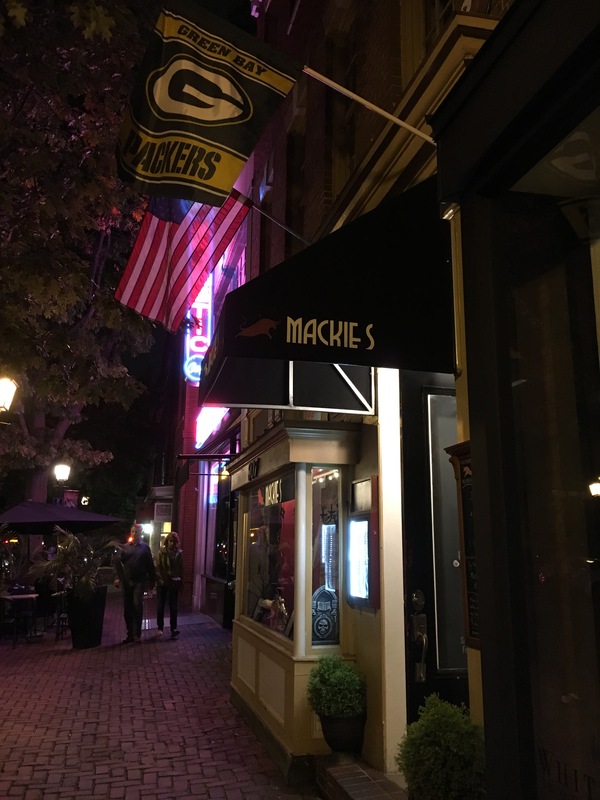 Pricing at Mackie’s is very competitive with other restaurants of its caliber in the area and offers a great Happy Hour and Brunch on Saturdays and Sundays. They will be open on Thanksgiving and are serving a traditional menu of turkey and all of the trimmings. If you haven’t been to Mackie’s, give it a shot. You won’t be disappointed.